The words 'MR And MRS' are fixed. You can then personalise this plate with a surname up to 15 characters in length followed by a message over 3 lines of 25 characters per line. The surname will appear in UPPERCASE. All other personalisation is case sensitive and will appear as entered. 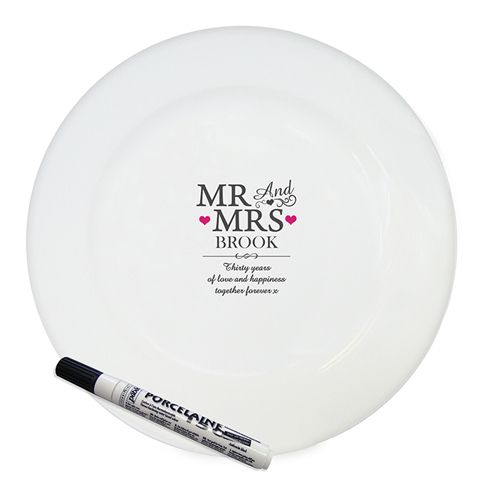 Supplied with special pen for family and friends to sign. Allow 24 hours for all the writing to dry, to make sure the message you have written won't fade over time. A beautiful and lasting memento you'll want to keep and cherish forever. Personalise with a surname up to 15 characters in length followed by a message over 3 lines of 25 characters per line.